Effective immediately, Professional Coin Grading Service has announced a new crossover policy for Collectors Club members and authorized dealers who now may submit mint state and proof coins graded 70 by another service with those top grades cited as the minimum acceptable crossover grade. Previously, PCGS would only allow crossovers to have a minimum designated grade of MS69 or PR69. NGC still has that policy. Before we discuss details of the new policy, which many collectors and dealers will favor–primarily because of the premiums an MS70 or PR70 can bring in a PCGS holder–it should be noted that graders at both top holdering companies always had three choices under PCGS’s old and NGC’s continuing policy. Case in point: In the past, if a hobbyist or dealer submitted an ANACS MS70 Silver Eagle, for example, the submission form would have to state “MS69” as the minimum acceptable grade. That coin could come back as MS69, DNC (“Did Not Cross”) or, in rare cases, MS70. Sources at both companies confirmed this latter option has occurred before in modern coinage. There’s a reason: corporate reputations are built on consistency. Crossover grading is about the coin and not the holder. (See my previous crossover columns as proof.) Grading standards vary at each service, so “consistency” is subject to differing measures–even between PCGS and NGC. That variable alone increases the odds of a coin graded by one company coming back at a different grade by the crossover company. Every collector should keep that in mind. Nevertheless, hobbyists and dealers like crossover access to PCGS. While customers at NGC have complained in the past about crossover grades–to the extent that now NGC only considers PCGS for crossovers–just as many collectors and hobbyists dissatisfied with grades like to have other options apart from cracking out coins (which can damage those coins if done improperly). PCGS continues to allow crossover submissions for any previously holdered coin. This is why many PCGS club members and dealers will be excited by the new policy. Let’s return to that adage about the importance of the coin, not the holder. As a practical matter, the holder can get in the way of a perfect grade at PCGS … if the submitter demands MS70/PR70 as the minimum grade and the current holder’s plastic contains scratches or other impediments. A conscientious grader would have to state “DNC” because a determination could not be made in the coin’s current holder. However, newer NGC and PCGS holders are exceptional with scratch-resistant qualities as well as edge views. If you’re paying for holdering, especially for top-graded modern coins, then you want to display your coin in a first-class holder. For qualities of NGC’s holder, click here. For PCGS, click here. Scott Schecter, NGC vice president, confirmed in the wake of PCGS’s new policy that his company has elected not to take the same route with MS70/PR70 as minimum grade because the smallest hairline can be hidden by the plastic. This is especially true for coins that lack scratch-resistant holders. “We have always elected not to take on the liability,” he added. 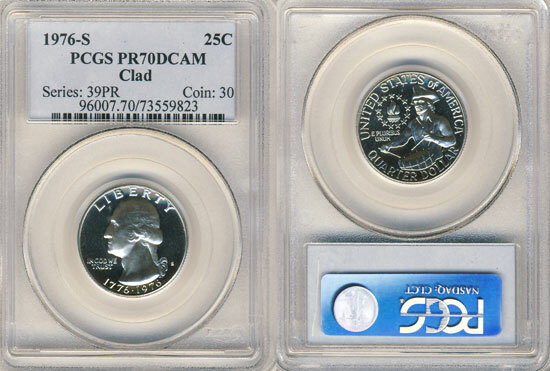 Certain issues and series of modern coins skyrocket in value with an MS70/PR70 designation. 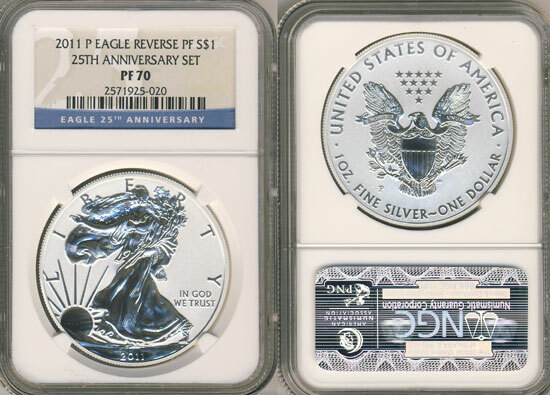 A popular example, of course, was the widely publicized PCGS 1995-W Proof-70 DCAM Silver Eagle that sold for $86,654.70 last year with more than 100 bids in a GreatCollections auction. Savvy collectors will be more selective in trying out PCGS’s new crossover policy. Can you imagine the premium on that coin coming back MS70 in a PCGS holder? There are other examples of modern condition rarities at the MS70 level. This new PCGS policy will make you dive into price guides to see which ones. Nobody mentioned in the article whether the PCGS’s First Strike and NGC’s Early Release labels will also crossover along with the grade. For most of my graded coins, I prefer NGC, mostly for their new holder introduced a few years ago. Yet storage can tip the scale to PCGS, especially for larger coins. I can fit two of the PCGS slabbed 5-ounce America-the-Beautiful pucks into the same space as just one NGC oversized holder. Because coins graded early by both companies are worth a premium on the open market, it would be nice not to sacrifice the early strike designations. I didn’t ask that question, didn’t think of it really, because it would seem that this notation on the label would not be subject to crossover. I cannot point to a case in my own collection; but any extraneous symbols on labels from NGC or other companies never crossed over in my own submissions. I suggest contacting PCGS Customer Service about that. Would you think the ANACS graded MS70 2014 Five Star Generals Half Dollar would be another example of something to send to PCGS now for crossover? Yes. There haven’t been enough submissions to get price data for you, as this coin is only recently released. Here’s what I suggest, though. Hold as many pertinent ANACS 70 coins as possible, say 5, and do a bulk crossover submission. Hope this helps. Much thanks. I going to do just that. Hopefully at least one of the four I have will crossover. When I looked earlier today there are only 49 MS70 combined between PCGS and NGC. with this development would you recommend for or against reholdering old NGC slabs into new non-scratch at NGC or submit to PCGS for crossover? Mostly MS65 thru MS67 early commemoratives? Some of the older slabs are collectible and can command a premium, especially the NGC fatty or soap dish holders. If the coin is valuable you might want to re holder to enjoy the views that scratch resistant slabs provide. That’s a book, Jess. Go to the websites of PCGS, NGC, ANACS or ICG and read “how to submit.” If you live near a coin shop, usually the dealer can submit the coins for you. You can also consign your coins to Great Collections (go to its website) and download a “raw coin consignment form.” Great Collections not only will get your coins graded; they will auction them for you–provided the coins have value, of course.